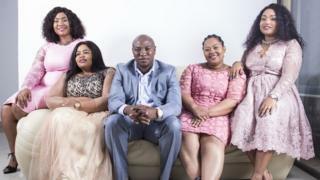 A new hit reality TV show has restarted a debate over the traditional practice of polygamy in South Africa. Musa Mseleku says he wants to change people's perceptions of polygamy. And he's getting some help - from his four wives. 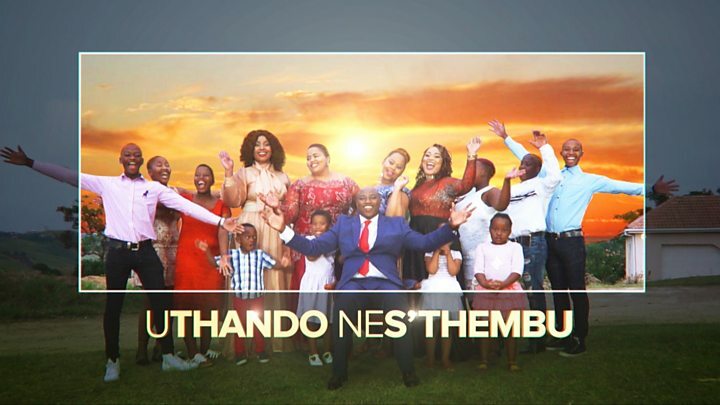 The 43-year-old property developer, along with his wives and their 10 children, are the stars of a new reality show called Uthando Nes’thembu, which translates as "Love and Polygamy". The series, which premiered 19 May, is consistently a top trending topic on Twitter in South Africa, with thousands of tweets debating the place of this traditional set-up in modern society. The show is filmed at the Mselekus' rural homestead near Durban, in KwaZulu-Natal's south coast. The four wives each have their own house but share the land. Media captionThe wives go grocery shopping - but does it go to plan? "One of the biggest misconceptions [about] polygamous lifestyles is that it is a culture which seeks to oppress women," Mr Mseleku tells BBC Trending radio. "That's one of the reasons we wanted to do the show, to allow people to see that it's not like that in our case. I want to show men that you can be in a polygamous relationship and also be a considerate husband." However, not everyone agrees. While several people expressed their appreciation for the show, some feel that the lifestyle is indeed restrictive. Some tweeters, mostly female, picked up on an episode where Mseleku insisted on a 17:00 curfew for his wives. They also have to ask his permission if they want to hang out with their friends or drink alcohol. "I believe that in each and every house, especially us as South Africans, we believe your husband is like your god," Thobile Mseleku, Musa's fourth wife, tells BBC Trending, "So you can't just do what you wish, unless he gives you his blessing." Musa Mseleku adds that he also has restrictions imposed on him. He has to be home an hour earlier than his wives, he says, "so I can prepare for them all!" Thobile and Musa have been married for nine years. When she met him, he already had two other wives, so she says that she knew what she was getting into. Her grandparents had also been part of a polygamous family. She says that the four wives - the others are Busisiwe MaCele, Nokukhanya MaYeni and Mbali MaNgwabe - are like sisters and rely on each other for advice and help. Image caption The four Mrs Mselekus. Thobile (far left) says the women rarely have conflict and are "like sisters"
But the show, which explores how the four Mrs Mselekus balance their daily routine, careers (which include business and government jobs), household commitments and parenting duties, also shows the tensions within the family. "Our biggest source of conflict is time," Thobile Mseleku says. "It can be frustrating if we're all going to go out together and one is ready and you have to wait for one of the other wives." Time, adds Musa, is something he thinks about a lot. "I try to make sure that I divide my time equally between the women and my children." In South Africa, polygamy - while not adopted by the majority of people - is not illegal, nor specific to a particular religion. It is most common among the Zulu ethnic group, and South Africa's President Jacob Zuma, himself a Zulu, has three wives. Ndela Ntshangase, a lecturer in the school of Zulu studies at the University of KwaZulu-Natal, says that the polygamous unions in South Africa began to wane in the 19th century when white missionaries preached that conversion to Christianity entailed divorcing one's "extra" wives. "British colonisers pushed [monogamy] down the throats of black people through taxes that rose for each wife, and land allocations with insufficient space for polygamous family units," Ntshangase says. But can it work both ways? Would Musa Mseleku be OK with one of his wives taking another husband? "No way," he laughs, "I would die!" Thobile says her husband's attitude doesn't bother her. "We chose this life. We chose him and him alone." So is there room for a fifth wife? "We are exploring that on the show," Musa says, "so keep tuned in."